Piercing Guns and why you should avoid them. Why oh why do parents take their little darlings to retail shops to get their ears pierced with a gun? Don’t get me started! Having a piercing involves deliberately creating a wound in the flesh, a wound that you want to heal with the minimum of fuss. That earring post that you can feel protruding through the butterfly clip has just punched a hole in your daughter’s ear lobe. It’s blunt, obviously, (otherwise it would be dangerous afterwards) but imagine what happens when you hammer a blunt object through cartilage. There is inevitably some splatter (the flesh has to go somewhere) and typically some of that splattered flesh ends up on the piercing gun. Much is made of the fact that the jewellery used in a piercing gun is sterile (sure) but the gun itself is never sterilised (it would melt in an autoclave). You cannot be sure that none of the dozens/hundreds of children who went before were carrying an infection, including Hepatitis B or C.
What about the wound the piercing gun makes? There are no clean edges which means that it is harder to heal and there is likely to be more scar tissue in the hole. Furthermore, the body’s typical reaction to blunt force trauma is to flood the area with blood and other antobodies which means the earlobe will swell. But the butterfly clip is rammed up against the back of the ear so it has nowhere to go. In the worst cases, the butterfly clip gets embedded into the ear (as shown in the picture alongside where all you can see is the tip of the butterfly, the rest has been consumed by the ear). What you can be sure about is that any swelling will be painful in the days that follow and it is almost inevitable. Why do this? 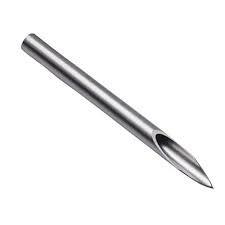 By contrast, a piercing needle is incredibly sharp and is hollow; in fact it’s really a hollow scalpel and it cuts the flesh surgically, leaving super clean edges along the wound. It’s pretty obvious that a wound like this will heal much more cleanly than the battered hole left by a blunt pole rammed through the ear. The healing process we are looking for in a freshly pierced wound is that the body forms a channel between the entry and exit of the piercing. What happens is that over time the body lays down scar tissue along the channel of the wound and once healed, this will be secure and (relatively) smooth and will allow the insertion and removal of jewellery at will. This process is assisted by the clean edges of the surgically created hole that a piercing needle makes and is hindered by the mess that the piecing gun makes. Finally, with a piercing made with a needle, you can size the jewellery to fit the ear (and it is good practice to allow 2mm extra for swelling) and the best piercers only use titanium jewellery which is the most hypoallergenic and smoothest of materials. Needless to say at PiercerJack we only use titanium for initial piercings (which can also come in gold and black) and have a range of pretty jewels to choose from. You can see some of our jewellery here. Oh and we never use guns!